Any form of figure drawing requires the artist to closely observe the subject, leading to enhanced drawing skills. Drawing is all about seeing after all, and the stronger you are at understanding what you see, the better you become at drawing. There is no true formula for drawing people. Because the human figure is so dynamic, a formula that fits every possible position simply doesn’t exist. However, there is a step by step approach that can help you in the drawing process. I like to use a four step approach to figure drawing to help construct the form of the subject. Each step is an exercise of observation and making comparisons that leads to a more accurate drawing of the figure. This approach works wonders when drawing the figure from a standard view, but when the figure is in perspective and foreshortening is a factor, the challenge is much greater. We have to pay special attention to what happens to standard proportions when we draw a figure from such an exaggerated point of view. We're all probably familiar with linear perspective, a drawing method that utilizes lines to create the illusion of space on a flat, 2-D surface. There are three forms of linear perspective including one-point perspective, two-point perspective, and three-point perspective. Each form is selected and implemented by the artist based on the point of view of the viewer. While linear perspective is mostly used for drawing buildings, trees, roads, etc. in a landscape, we can apply its principles to drawing the human figure in perspective. Linear perspective helps the artist to better understand how we perceive objects in three-dimensional space and communicate that information in a drawing. It does this by structuring the distortion that happens when we draw objects in space. Foreshortening refers to the distortion that happens when we draw the human figure in space, especially from an exaggerated, or extreme, point of view. The figure can be placed in an indefinite number of positions and order to capture the figure in these specific types of poses, artists must be able to recognize and replicate the distortion that exists in a pose. Foreshortening is simply what happens when the human figure is viewed in perspective. Foreshortening happens in almost every natural human pose, but it is most noticeable in extreme "points-of view". These extreme points-of-view can be a "worm's eye view", looking up at the figure; or a "bird's eye view", looking down on the figure. There are other possible angles where foreshortening can occur as well. Although the four step approach to drawing the figure (mentioned earlier) works great for drawing the figure from a standard view, it doesn't mean that we must abandon it completely when we approach the figure from an extreme angle. In fact, we can still apply this approach as long as we understand the role that distortion plays in the lines that are drawn. Drawing this line will ensure that the entire figure will fit on the surface and it will help in planning the rest of the proportions of the figure. Notice how much shorter this line becomes when the figure is viewed from an extreme angle. Notice how the line for the shoulders is much longer and the distance from the waist line to the feet is much shorter when the figure is viewed from above. After the lines for the waist and shoulders are defined, the structure of the figure can be planned by drawing a stick figure. (Yes, you read that correctly.) Approach this step as if you are defining the bone structure of the figure. Instead of drawing a line for the torso, a geometric shape is more appropriate. Geometric shapes can also be drawn for the hands and feet. With the figure’s basic proportions defined on the surface, the artist can “thicken things” up by drawing the contour lines of the figure with confidence. Details of the clothing, features, and props can be defined. The illusion of a light source can be attained through the addition of a range of value. Any form of figure drawing is challenging. Drawing the figure in a pose that creates distortion can be even more of a challenge. However, if we understand what we are seeing and how to create the required illusion on the drawing surface, we can be successful. When the figure is in perspective, and foreshortening is a factor, it's all about distortion. The more extreme the angle and point of view, the greater the distortion. 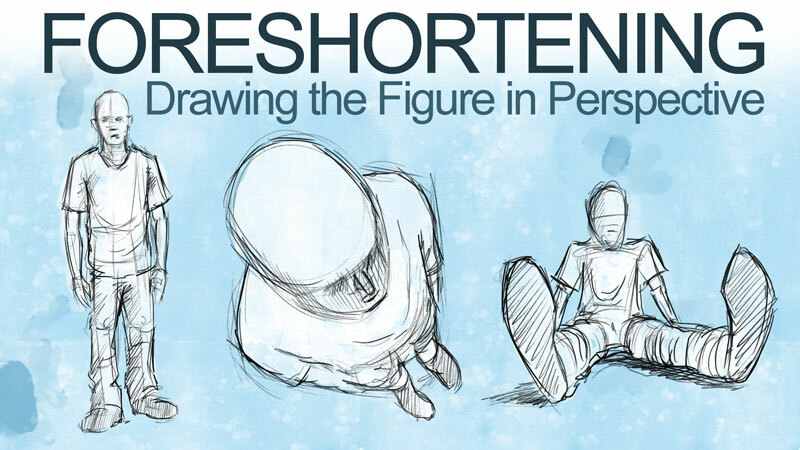 If we understand this and apply it to our figure drawings, then foreshortening is something that we can all master.